The Japan Aerospace Exploration Agency (JAXA) Hitomi satellite, a new-generation observatory, designed to study some of the most powerful phenomena in the Universe by probing the sky in the X-ray and gamma-ray portions of the electromagnetic spectrum. 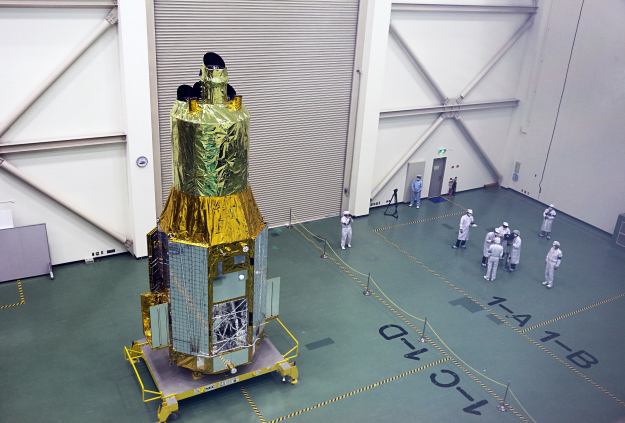 Hitomi (known as ASTRO-H prior to launch) was developed by JAXA in collaboration with institutions in Japan, the US, Canada and Europe, and was launched on 17 February 2016. This photograph was taken on 27 November 2015 at the Tsukuba Space Center, Japan.